In 1888, while our founder, St. Henry de Ossó, still walked among us, the Society of St. Teresa of Jesus reached across the ocean from Spain to enter Mexico. The first foundation in the new world was in the city now known as Puebla, with many more foundations soon following in the new province. By the year 1910 there were eleven schools, all prospering and full of life. But the political situation in Mexico rapidly deteriorated and the revolution that resulted posed a threat to all religious congregations. The general government of the Society decided to look for refuge for the Mexican sisters in the United States. After making the necessary contacts, on December 12, 1910, on the feast of Our Lady of Guadalupe, the first group of sisters left Mexico for San Antonio, Texas. Bishop Shaw received them into his diocese and allowed them to begin by renting the old bishop’s residence at little cost. 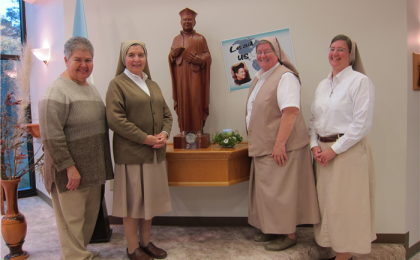 There the Sisters started what in time would become St. Teresa’s Academy. New groups arrived from Mexico and more foundations were made. 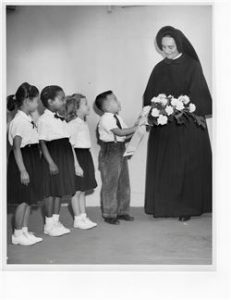 Parochial schools were established in Uvalde, TX (1913) and New Orleans, LA (1915), as well as many others which lasted only a short time during those years of transition and searching. Through the years, the province spread also to other countries: Cuba, (1915), Venezuela (1945), and Nicaragua (1954). The difficulties faced in the U. S. seemed insurmountable. As with most religious foundations, our sisters worked in situations of extreme poverty, exacerbated by the fact that they did not know the language. The Mexican sisters, urged by the General Government, made efforts to learn English, but the process was neither easy nor quick. To supplement their meager income, the sisters had recourse to doing what some knew how to do well: doing embroidery. This gave them work and provided dollars for the community, but took badly needed time to study English. One more difficulty resulted from the fact that the sisters were not ready or eager to change the Spanish customs of the Society to the local ways. Inculturation was not a concept of the times, and therefore vocation promotion was difficult. 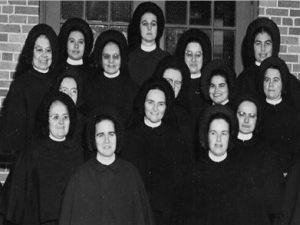 On several occasions, the few sisters who knew English were sent to strengthen the English departments in the large schools in Cuba, Mexico, Venezuela and Nicaragua. This produced a general sense of frustration and discouragement. 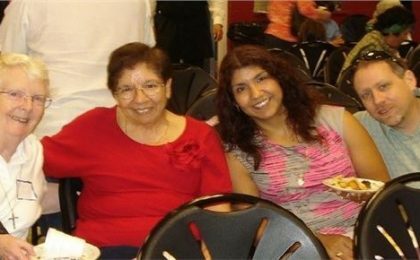 Formation was offered completely in Spanish for many years, preventing English-speaking women from joining the Society, and making it very difficult for the few who did. The situation came to a head when the General Chapter of 1957 decided to split the province in two. In August 1958, the U.S. and Nicaragua became one province: St. Francis de Sales. Because of the High School in Managua, the interchange of English-speaking sisters was still necessary for many years. Finally Nicaragua too became self-sufficient. In 1985 it separated from the U.S., becoming the new province of Christ the King. After that turning point, our small US province launched a major effort to inculturate the Teresian charism so as to be able to offer it to potential candidates and to reach as many people as possible in our ministry, always keeping faithful to our Hispanic roots. Today we still prize our bilingualism as well as our multicultural backgrounds, putting them at the service of our people in every way we can. Due to the scarcity of personnel, and for various other reasons, we no longer administer any schools. Yet education is as central for us today as it was in Henry’s times; the Society of St. Teresa of Jesus has undertaken a multitude of educational ministries in the United States: we serve in learning centers, schools, universities, and parishes; we teach children, young people, and adults; we do catechetical and administrative work in parishes; we work with immigrants and refugees, helping as we are able, at whatever level is needed; we offer counseling, formation, and spiritual direction to adults of diverse cultures, backgrounds, and needs. In short, our educational goal has widened to address the needs of a society in transition, a society desperate for a vision that offers hope. Coming soon: We will look at some of the moments of the history of our Sisters in the United States. Small in numbers, we look toward the future with high hopes, discovering possibilities in the plan for re-structuring our Society in the next few years as we discern the best way to put our gifts at the service of the Church.